For most people, marriage is one of the most important decisions and realities of their life: in it they form a community of love. For Catholics, marriage is not merely a civil contract but is a covenant between a man and a women before God. If both are baptised, the marriage is a sacrament, a symbol of the unity of Christ and the Church. A sacramental marriage is a means of grace, giving strength to the husband and wife to live out their commitment and to help each other to holiness. As you prepare for marriage, you will be asked to reflect carefully and prayerfully on the nature of this sacrament. Before we look at some of the steps of that preparation process, consider some of the points made in the Catechism of the Catholic Church. (1660) The marriage covenant, by which a man and a woman form with each other an intimate communion of life and love, has been founded and endowed with its own special laws by the Creator. By its very nature it is ordered to the good of the couple, as well as to the generation and education of children. Christ the Lord raised marriage between the baptised to the dignity of a sacrament. (1661) The sacrament of Matrimony signifies the union of Christ and the Church. It gives spouses the grace to love each other with the love which Christ has loved His Church; the grace of the sacrament thus perfects human love of the spouses, strengthens their indissoluble unity and sanctifies them on the way to eternal life. 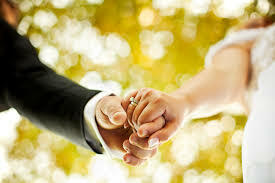 (1662) Marriage is based on the consent of the contracting parties, that is, on their will to give themselves , each to the other, mutually and definitively, in order to live a covenant of faithful fruitful love. Any marriage involving a Catholic is subject to Church norms known as "Canon Law". Catholics are obliged to marry in the Catholic Church, following a marriage rite of the Catholic Church. Their exchange of vows must be witnessed by either a priest or a deacon and two other witnesses. Most couples reserve a reception location a year or even more in advance. Before you do that, or contract with a photographer, think about invitations or make any other arrangements, you need to talk to your parish priest. Diocesan guidelines say you should do so at least 6 months before the time you would like to get married. Be sure to allow extra time - usually more than a year - if either of you require an annulment. Once you speak with your priest, you will begin a formal process of marriage preparation. This involves a process of discernment which is meant to be an affirming experience as you become more aware of your readiness to enter Christian married life. Your parish priest has the responsibility for your marriage preparation. The preparation will consist of participation at one or two diocesan marriage preparation sessions usually organised for all the couples in Ipswich along with a series of meetings with the priest depending on the need of the couple. You will have an opportunity to plan the ceremony during one or more of these sessions. The meetings contain some formal input, some discussion and a time of prayer, and the content of this preparation course can be adapted to suit any specific needs of the couple. You will have to provide copies of your baptismal certificates, an affidavit of free status, annulment papers, divorce papers in some cases or death certificate of previous spouse. You will need to contact the local Registrar's office and make an appointment for a licence to get married at this church. This licence should be given to the priest at least 6 weeks before your wedding and will then in turn be given to the authorised person who acts as registrar at the wedding service. Without this licence we will not be able to celebrate your wedding at St Mary Magdalen church. There are a number of options available from which you can chose. The priest will assist you in understanding the nature of the liturgy and the various options and choices regarding music, readings and the ritual. The wedding liturgy should be planned to encourage the participation of the assembly through hymns and prayers. You may like to book an organist for your wedding - please discuss your wishes with the priest. The church is equipped with a sound system incorporating a Bluetooth receiver allowing pre-recorded music to be played too. You are welcome to arrange your own florist to decorate the church for your wedding. Please discuss this with the pries however, to arrange a suitable time for access to the church to be given to the florist to carry out their work. If you want to keep costs down, our parish flower ladies will be happy to arrange flowers for you for a small donation plus the cost of the flowers. This will be conducted by the priest near the day of your wedding. This is part of the preparation process and offers an excellent opportunity for the wedding party to join together in prayer. It is important that all parties involved in the ceremony - the bride's father, best man, bridesmaids, readers, ushers and those who bring up the offerings - participate. On the day, we understand that is is often the practice, or at least an acceptable custom, for the bride to be late for her wedding! Please remember however that it will prove to be inconvenient for a number of people if any delay is more than a few minutes. Neither the priest nor the Church charge a fee for celebrating a sacrament. However, since a lot of time and resources are put into making your wedding day a wonderful occasion, you are invited to make a donation in the region of what you would spend on your wedding cake. The authorised person (Registrar) charges a fee set by local government (currently £86 in Suffolk County Council area). Your organist will inform you of the charge to be made - typically in the region £100-150 depending on distance of travel).